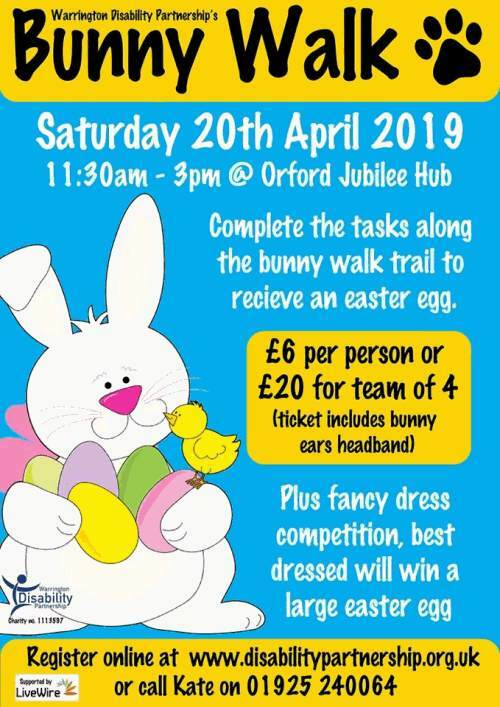 The WDP Bunny Walk on Easter Saturday, 20th April 2019, at Orford Jubilee Hub is a fun event suitable for all ages and which will help raise funds for WDP. Everyone who enters will receive a free bunny-ears headband. Complete the tasks along the bunny walk trail to win an Easter Egg. There will also be a fancy-dress competition and the best-dressed entry will win a large Easter Egg. The walk will be outdoors, in Jubilee Park, and the course is just under 1km, but you can do the course as many times as you like. The park is fully wheelchair accessible. Saturday 20th April 2019, 11:30am to 3pm. We have a variety of start times during the day: 11:30am, 11:45am, 12:00pm, 12:15pm, 12:30pm, 12:45pm, 1:00pm. When booking, please remember to say which time you would like your walk to start on. £6 per person, or £20 for a team of four. The ticket price includes your bunny-ears headband. Advance booking to avoid disappointment is recommended. You can pay in advance by phone using a credit card, by post if you would prefer to pay by cheque, or online using either a credit card or your Paypal account. For payments on the day, we will only be able to take cash payments. Please use this form to book and pay online. We use the secure Paypal payment service. You will be able to pay using either your Paypal account, or any major credit or debit card. Tickets are priced at £6 per person, or £20 for a group of four people. A ticket is required for each adult and each child. Please enter the total number of tickets required and we will automatically apply group discounts for bookings of four or more people. When you preview your booking, we will show you the total payment due and give you the option to pay online using a credit card. Your details will be used only for the purpose of booking your place on the Bunny Walk. You will not be added to any mailing lists and your details will not be passed on to any third parties. If you have any difficulties using the online booking, we are happy to take bookings over the phone, by post, or in person if you visit the Centre for Independent Living. Cheques need to reach us no later than Tuesday 16th April. Please write your name and address on the back of the cheque. You can call into the Centre for Independent Living any time we are open and pay using a card, cheque, or cash. Visitors are always welcome and while you are here you can look around our excellent equipment showroom or enjoy a coffee and cake in the Calleries Cafe. Please note the centre will be closed on Good Friday, Friday 19th April.